You’re intrigued, I can tell. As well you should be, because Kame-kun is one of the most endearing characters you’ll come across in speculative fiction…and he never says a word. Reserved, polite, uncertain, haunted- Kame-kun is all of these things because he is out of place on so many levels. 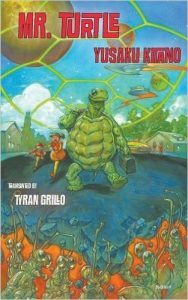 Not only is he a turtle living amongst humans; Kame-kun is a cyborg, engineered to help fight a war on Jupiter against bio-engineered Super Crayfish that were originally developed by a film company interested in making a movie about Jupiter after humans figured out how to open wormholes to that planet. Ultimately, Kame-kun realizes that the development of cyborg turtles like himself is part of a larger plan for humans and cyborg armies and…well, I’ll let you find out for yourself. I’ll just say here that Kitano’s writing style is addictive- measured, controlled, but with an ebullience just simmering under the surface. I want to read more of his “Turtl[e]pic” and I want to read it yesterday.